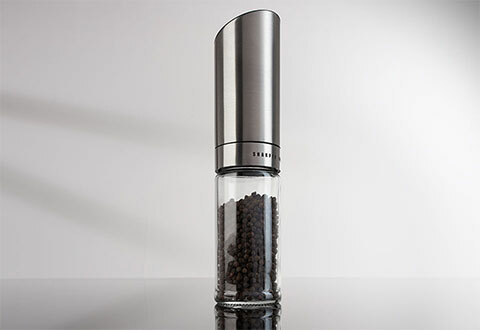 The Gravity Controlled Salt or Pepper Mill dispenses your favorite peppercorn or sea salt with ease. Simply twist the glass portion of the device open and fill with pepper or salt. Twist back into place to close and flip the device upside-down to begin automatically grinding onto your dish. 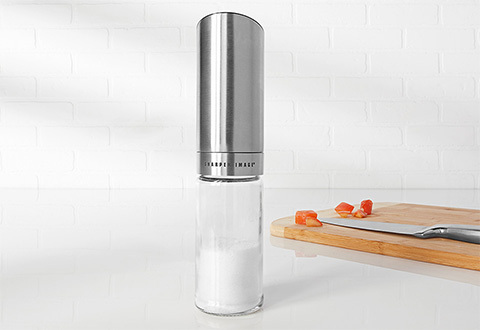 Features a knob that allows you to adjust the coarseness of your seasoning to your liking. Ideal for a one-handed seasoning solution for busy chefs and backyard grillmasters. The Gravity Controlled Salt or Pepper Mill is the easy way to grind fresh peppercorn or sea salt. Just flip upside-down to begin grinding.